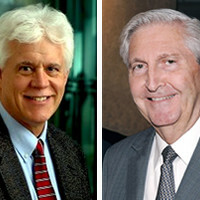 Dr. Eric Olson, chairman of molecular biology, and Dr. Kern Wildenthal, retired president of UT Southwestern Medical Center, are being honored by the International Academy of Cardiovascular Sciences – North America Section for their outstanding leadership and contributions in the field of cardiovascular education and research. The Canada-based Academy has established two orations – a clinical oration in honor of Dr. Wildenthal and a research oration in honor of Dr. Olson – as part of a newly created Cardiovascular Forum to be held annually at different institutions in the U.S. and Canada. The effort is part of a program to promote Centers of Excellence and young investigators. “Both these individuals are role models and a source of inspiration for the cardiovascular community,” said Dr. Naranjan S. Dhalla, executive director of the International Academy of Cardiovascular Sciences – North America Section. Five clinician scientists for the Kern Wildenthal Cardiovascular Orations in Clinical Medicine and five medical research scientists for the Eric Olson Cardiovascular Orations in Biomedical Sciences will be invited to present their talks at the annual Cardiovascular Forum sponsored by the Academy and held in August. The forum encourages collaborations and cooperation among cardiovascular investigators with diverse expertise; to blend biomedical sciences with clinical investigations; to emphasize translational medicine for improving cardiovascular health; and to promote the interaction of graduate students, postdoctoral fellows, residents, and clinical fellows with both young and well-established investigators in seeking solutions to diverse cardiovascular problems. Dr. Olson is a member of the National Academy of Sciences, Institute of Medicine, and the American Academy of Arts and Sciences. He directs the Nancy B. and Jake L. Hamon Center for Basic Research in Cancer, and the Nearburg Family Center for Basic and Clinical Research in Pediatric Oncology. He was awarded the 2012 Passano Award for identifying major genetic pathways that control the development of the heart and other muscles; the 2005 Pollin Prize in Pediatric Research, a lifetime achievement award given for outstanding contributions in biomedical or public-health research related to the health of children; the 2009 Lefoulon-Delalande Foundation Grand Prize for Science; and the Pasarow Award in Cardiovascular Medicine. In addition, he received the Outstanding Investigator Award from the International Society for Heart Research, an inaugural Distinguished Scientist Award from the American Heart Association, and the AHA’s National Research Achievement Award. “Dr. Wildenthal is an icon in American medicine and also played a major role in recruiting me to UT Southwestern. I am honored to be associated with him through these Orations,” Dr. Olson said. 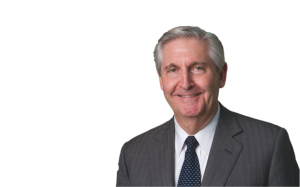 Dr. Wildenthal has been a visiting professor and conference organizer in more than 20 countries and has written 130 scientific papers in basic research and clinical cardiology, as well as numerous articles on health and education policy issues. He is a member of the Institute of Medicine of the National Academy of Sciences, the American Society for Clinical Investigation, the Association of American Physicians, among others, and is an Honorary Fellow at the University of Cambridge in England. He has chaired the North American Section of the International Society for Heart Research; the Science Policy Committee of the Association of Academic Health Centers; the Basic Science Council and the Science Advisory Committee of the American Heart Association; and the Program Project Research Review Committee of the National Heart, Lung, and Blood Institute. UT Southwestern, one of the premier medical centers in the nation, integrates pioneering biomedical research with exceptional clinical care and education. The institution’s faculty includes many distinguished members, including five who have been awarded Nobel Prizes since 1985. Numbering more than 2,700, the faculty is responsible for groundbreaking medical advances and is committed to translating science-driven research quickly to new clinical treatments. UT Southwestern physicians provide medical care in 40 specialties to nearly 100,000 hospitalized patients and oversee more than 2.1 million outpatient visits a year. This story is available on our World Wide Web home page. You can also stay updated on news about Kern Wildenthal through his Facebook, Twitter, Youtube, and Google pages.